How to protect your family and pets from tick bites? Ticks are very small arachnids, but they are quite dangerous. Unlike other insects, ticks latch on to the skin of humans and animals for a long time. There are many types of ticks, and some of the most common varieties are the Dog Ticks, Deer Ticks, and Lone Star Ticks. Ticks feed on the blood of humans and animals, and they stay in the skin of their prey for a few days or until they have sucked enough blood to satiate their hunger. Some species of ticks are carriers of dangerous diseases such as Lyme disease and Rocky Mountain Fever. Ticks live in warm and moist areas, and they easily crawl into the skin of their potential prey (humans and pets are the most common targets). 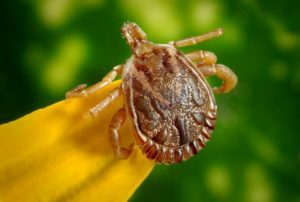 Since they live on skin and clothing for a long time, it is very difficult to identify tick bites till you or your pet fall sick. 1) Ticks love areas that are moist and filled with litter from the leaves and trees. The first thing that you need to do to prevent tick infestations is to keep the areas around your home neat, trimmed and clean. Trim the grass around the area of your home regularly and have a close watch on the overgrowth of weed. 2) Build exclusive fenced areas for your pets to play and walk around, so that they don’t stand a chance of getting a tick bite when they wander out. 3) Ticks are known for their notorious climbing features. So, if you have tall trees and plants around your home, you are more prone to tick bites than others. You need to remove all the tall trees, hanging plants and overgrowth of other vegetation near your home, as these are the favorite breeding areas of ticks. 4) If your locality is known for its tick population, you should always step out only after wearing a tick repellent on your legs, feet and other parts of your exposed skin. 5) If your pet comes inside your home after its walk-time or play-time, check its body thoroughly and feel for ticks, if any. If you notice strange lumps anywhere, you need to contact your veterinarian immediately because these lumps could be ticks latching on to your pet’s skin. Ticks are known for their sensitive feet. If they step on something that they don’t like, they will not enter your yard or home. It is highly recommended that you make a barrier of gravel or wood chips around your yard to prevent tick infestations. Birds can also carry ticks inside your homes as these small arachnids love to latch on to the skin of any bird that they find. If you have kept bird feeders near your home, you need to remove them immediately as they can also attract pets. In short, having a clean and trimmed area around your home and creating a safe, fenced play-area for your pets are great tips to prevent your family and pets from tick bites.